Meet Ameyoko, a big market hustling and bustling with activities . This was my first visit to this popular street in Ueno. Be careful not to lose yourself at the crossing by a wave of people scrambling across. But this crossing is much more ‘gentle’, than the one at Harajuku (personal opinion though). One needs to be careful not to get dragged by strangers. Right after I was out of the ‘waves of people’, I was greeted by a big sign “Ameyoko” across the street. It felt like an invitation, “Ready for shopping?”… of course… I am ready for a shopping experience. Though I wasn’t carrying much cash with me yet walking on the streets of Ameyoko made me feel I had enough for the day. Everything felt so reasonable and at discounted rates here. With attractive bargains and time sales one has to be sure about what to buy and what not to. That is when a list of things to buy is very useful else like me there are chances of getting overboard and shopping for things that may not be needed at all, especially at the souvenir shops. Ameyoko has everything. You name it and you find it. There are shoe shops, shops for clothes like sports wear, outer coats and jackets, etc and accessory shops include watches, handbags, jewellery, et al. Japanese souvenirs such as traditional wallets, keychain, intricately designed hair pins, etc. I have not finished yet. How can I miss out the variety of food from all across the globe and even fresh fish! How amazing is that?? Hold your breath because I am not done yet! If you need spices to complete your kitchen ingredients you can find them right here in Ameyoko. I am sure you won’t find them easily at the usual supermarket in Japan. Turmeric, ginger, Indian curry spices, cumin, nutmeg, variants of nuts, lentils, etc everything is here. You can buy these things in large quantities and affordable prices to stock up for a week. After all the shopping when you are tiring out there is ice-cream, juice, sorbets and fresh fruits waiting for you right across the corner. Keep some 100 yen coins handy as that is all you need to revive your spirits and go shopping again. You can have a reasonable shopping budget of about 500 to 2,000 yens here since everything is affordable and cheaper than the usual shopping outlets. If you are lucky at the right time and the right spot, I am sure you will be in for a bargain of 70% or even 80% ! But do not spend all your money here. Shop wise, save money! Already explored all the nooks and corners of Ameyoko? Must be exhausted and hungry? No worries! There are two kebab shops and other food stalls here. I had delicious kebabs on my last visit. If not the kebabs you can try fresh sushi and other traditional Japanese meal. There are cosy sushi restaurants that offer fresh fish too. So you have your options to choose from. Looking for more fancy items? Or you want to take a break and move to the usual shops? You can go to Uniqlo and GU, the regular brand outlets. If you are fond of outdoor and adventure you can hop into the North Face and Mountbell just about 5 minutes walk from Ameyoko. Ameyoko is a shopping paradise for souvenirs and a shoppers delight. I recommend that you must visit it before you travel back home to buy something for everyone and if not for everyone then for yourself too. You can get to Ueno by train or the cute panda bus. Stop at Ueno-okachimachi or just Ueno. But remember that this is not the Ueno Park. If you are apparently lost somewhere around the Ueno park just walk for 7 to 10 minutes to reach Ameyoko-cho. 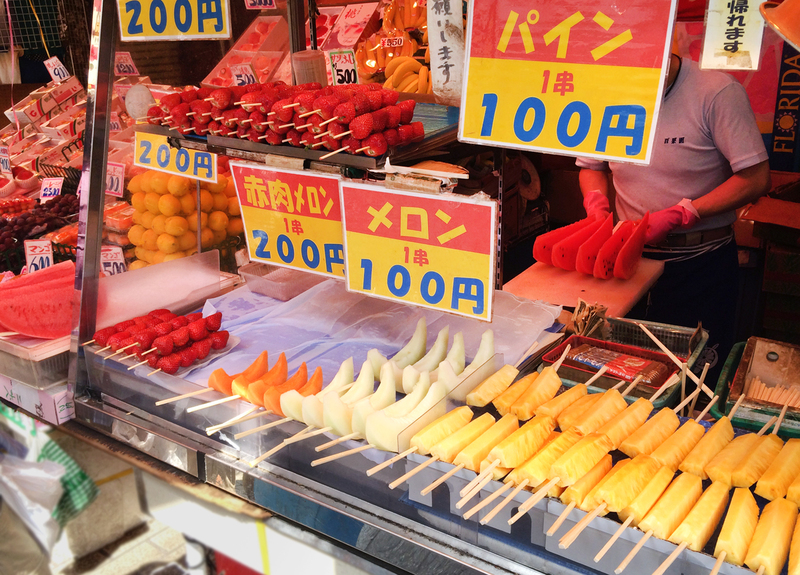 You can enter the market street from any of the gates and Ameyoko with its long shopping alleys will welcome you. Enjoy shopping!